Once again, the social strata of our world is regressing to an unacceptable level of sophomoric intolerance. Russia is hosting the 2014 Winter Olympics in Sochi amid turmoil caused by the nation’s egregious policies against LGBT people or as the government says, homosexual propaganda. The IOC halfheartedly assures athletes Russia’s anti-gay propaganda laws will not be an issue during the games, but they do not insist Russia suspend their intolerant policy. Olympic boycotts destroyed the dreams of so many hard-working athletes back in the 1980’s and a repeat of this form of protest only penalizes those undeserving. Unfortunately, much of America is focused on the Ed Snowden drama virtually unaware of this egregious assault on human rights. Vladimir Putin decided to grant asylum to dissident Ed Snowden, a transitory information-thieving patsy meant to irk the US Government, for one year. Obviously displeased, the Obama Administration cancelled the Moscow get-together between the two leaders following the G20 Summit set to take place the 5th and 6th of September. While many LGBT leaders worldwide express disdain over the homophobic, Orthodox-Christian policies of Russia, we are plagued by this canard of spy shenanigans distracting Americans once again thanks to the investigative journalism of emoprogs like Glenn Greenwald. Greenwald, an early Obama dissenter because of the president’s refusal to investigate the Bush administration for war crimes, has actively campaigned against our president since making Bradley Manning the divisive issue that kept liberals home in 2010 ushering in the worst Congress in US history. This adherence to far-left ideology only spited the American people by unleashing the worst case of stupid to infest our Legislative Branch. Consequently, the victims of his petulant, ideologue temper-tantrum are the poor and elderly who have been ravaged by the inhumane policies of the 112th and 113th Congress. Greenwald and Salon.com actually defended the Koch-funded Teaparty in 2010, practically labeling it a grassroots faction of the GOP. Other than the fact that (1) it is driven (at least in part) by genuine citizen passion and engagement, and (2) represents a justifiable rebellion against the Washington and GOP establishments. This has obviously been proven false as the Teaparty is anything but organic. By asserting the legitimacy of candidates like Christine O’Donnell, the emoprogs created significant apathy which led to extremely low voter turnout. The lower the turnout, the better the chance for Republican/TeaParty victories. The seeds for such a divisive movement have been planted and 2014 may look very similar. Greenwald misrepresented the scorn leveled upon Christine “I am not a witch” O’Donnell and her utter disregard for science and reason as an attack on her lack of financial wealth. His circuitous defense of her character as inherently moral (based on her monetary troubles) completely detracts from the real issue: The Teaparty and its fringe lunatic candidates have absolutely no business anywhere near positions of legislative authority. In order for us to forget O’Donnell’s utter incompetence, Greenwald created a canard of her poverty being attacked rather than her disregard of evolution as fact. Like-minded emo-progressives are so blinded by their hatred for Obama, they’ll go to any lengths to make their ideological points, even if that means most Americans will pay dearly. As far as the fate of Greenwald’s latest fame-whoring meal ticket, Ed Snowden will most likely end up a victim of his petty revenge-seeking against our President. Russia’s history of treating used up asylum seekers isn’t always as propitious as Snowden would hope. The hypocrisy of choosing China originally and Russia subsequently to escape prosecution negates the alleged sacrifice Greenwald claims Snowden has made. He regularly compares Ed to Daniel Ellsberg who stayed in the US to face the music of his leaking of classified data. 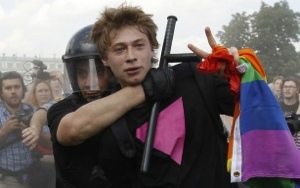 Ironically, this nation of Russia tolerates zero dissent and encourages violence against gays. Greenwald left the United States and became a resident of Brazil to be with his husband. It seems awfully ironic to condone Snowden’s asylum in a frightfully homophobic nation, while abandoning the USA for the very same reason. By harping on the NSA’s collection of metadata while non-oathtaking corporations like Yahoo, Google and Facebook have limitless resources to pry into our lives, he detracts from the much graver threat of violence against our homosexual brothers and sisters. Once again, the use of distraction for personal gain is ultimately detrimental for all parties involved. Progressives need to unite against this latest shiny object to maintain a sound perspective on what’s important. … and the turmoil continues!!! This is far from over ….. got until 2014!!! Putin is having a good laugh with Snowden. He called him the “unwanted Christmas present” a while ago, and will toy with him like a cat does with a mouse. Things will not end well for Eddie. You mean Snowden’s? That may just be part of an anti-American thing. I grew up in Europe, and can tell you that a lot of people there like to see the United States take a hit, regardless of who is President. Glenn Greenwald is not of “the left.” He’s a glibertardian and CATO Institute fellow who constantly compares Obama unfavorably to Ron Paul. He claims to be a civil libertarian, but his conception of civil liberties is so narrow that it happens to support right wing glibertardian memes. He is dismissive of attacks on reproductive choice, for example, and he has nothing to say about dozens of voter suppression measures in statehouses either. When he says “civil rights,” he is ONLY referring to Anwar Al-Awlaki, a traitor who earned his death by exhorting jihad against the United States. Greenwald is offended that a drone operator would y’know, AIM their Hellfire missile at Awlaki, so he uses inflammatory phrases like “targeted killing.” But he can’t be bothered to address Scott Walker’s attacks on labor rights in Wisconsin? Just consider the fact that Greenwald is living in a ritzy compound in Brazil and writing a column for El Globo about American abuses in South America…but has absolutely NOTHING to say about popular uprisings in the favelas right outside his own neighborhood. As I say, there is nothing about Greenwald that strikes me as consistently progressive or liberal. His main role in life seems rather to be a pied piper who misleads the left to the advantage of the Rand Paul set. Nicely stated. Thank you. I couldn’t agree more. Unfortunately, left-wingers somehow identify with this charlatan. Thank you for shining a light on ~ more villains!